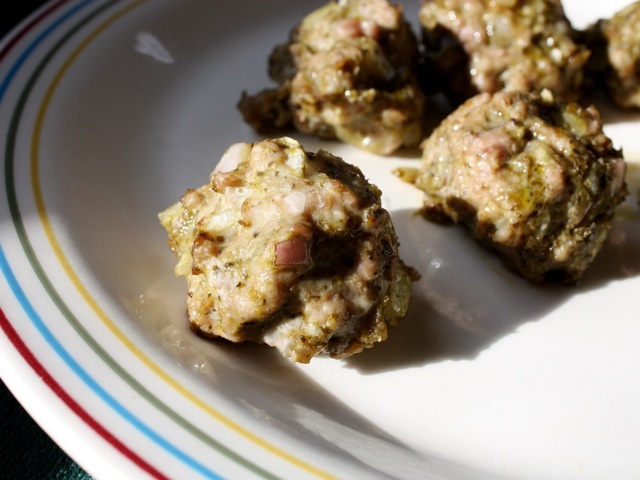 Used in Italian Wedding Soup, these meatballs are easy to make ahead and freeze. Mix all the ingredients together. Form into walnut-sized meatballs, place on ungreased baking sheets, and bake in a 350-degree oven for 15 minutes. Remove from the oven when done and add to the simmering soup. Culinate editor's notes: You can use a food processor to mix all the ingredients together. Just be careful to use the pulse button, so you don't wind up overmixing the meat into mush.